The Cruz Control Scenario In Texas : It's All Politics The chatter about a possible primary challenge to Sen. John Cornyn from GOP Sen. Ted Cruz's father might get louder as a result of the government shutdown debate. 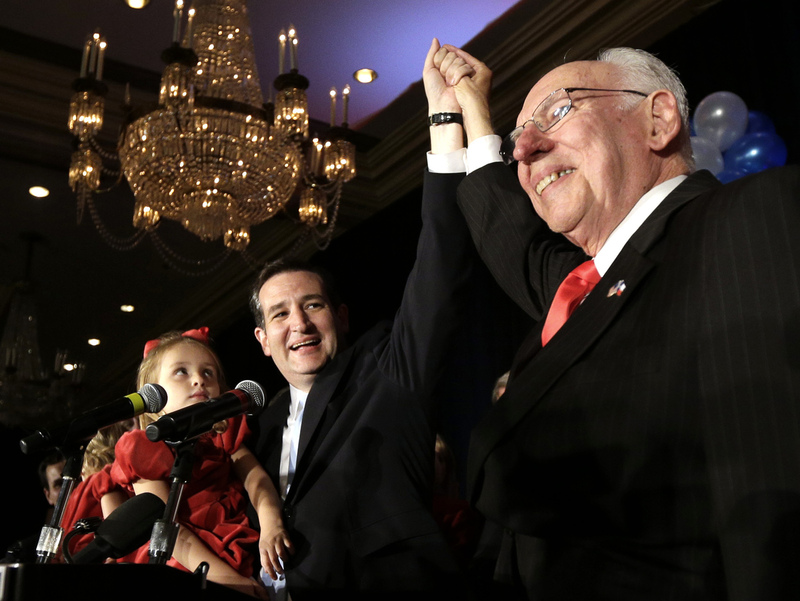 Republican Ted Cruz (left) raises his hand with his father, Rafael, while holding his daughter Caroline during a victory speech in November 2012. Could Texans soon be represented in the U.S. Senate by the Cruz family? It's an entertaining though wildly improbable scenario that's been generating some chatter at the GOP grass-roots level. But the notion of Tea Party hero Sen. Ted Cruz serving with his father, Rafael Cruz — a Tea Party star in his own right after a series of anti-Obama speeches at town halls hosted by Heritage Action — just got a wee bit less outlandish. The reason? John Cornyn's decision not to back his junior colleague's long-shot attempt to "defund" the Affordable Care Act. Cornyn, Texas' senior senator, was already suspected of being insufficiently conservative by Tea Party activists. He raised Tea Party hackles when he first signed, then removed his name from a letter vowing not to vote for any spending bill that included money for Obamacare. Now Cornyn has indicated that he, along with Senate Minority Leader Mitch McConnell, would not block a House bill that extends funding for the government but stops funding for Obamacare. Ted Cruz and his allies argued that because Democrats who control the Senate plan to eliminate the Obamacare language from the bill, the only way to accomplish what they want is to stop consideration of that bill entirely. McConnell already has a Tea Party-backed challenger in Kentucky, and Cornyn's decision means he, too, may soon face an opponent from his right. That's where Rafael Cruz comes in. Neither Cruz has suggested that Rafael might challenge Cornyn. But the elder Cruz — a Cuban native, now a Dallas preacher — has already been talked about as a possible opponent, even before this latest incident. "More and more tea party activists are whispering that he should challenge John Cornyn," Erick Erickson wrote in late August on the popular conservative grass-roots site RedState. Should Rafael Cruz run and win, he and Ted would be the first-ever father-son team representing the same state in the Senate at the same time. In the mid-1800s, Henry Dodge and his son Augustus Dodge served in the Senate together, but with Henry representing Wisconsin and Augustus representing Iowa.